While on his mission as a member of The Church of Jesus Christ of Latter Day Saints in California, Dr. Erickson discovered what chiropractic care could do for people. He met a chiropractor who was in the ward he was serving in, and had some remarkable experiences while in his office. “I’d thought about going into medicine or physical therapy, but decided I should look into chiropractic instead.” Always having enjoyed hands-on activities and problem-solving, it turned out that chiropractic was a perfect fit. A year and a half after his graduation, Dr. Erickson met a chiropractor who worked with allergies. He’d always suffered from hay fever and other seasonal allergies. After visiting this wellness-oriented chiropractor, approximately 95% of Dr. Erickson’s allergies were gone. It made him realize that chiropractic pertains to the health of the body, not just influencing individual parts like muscles, ligaments or bones. Since graduating, Dr. Erickson has received training in Chiropractic Biophysics®, NAET, Epic Pediatrics case management, and Advanced Muscle Palpation, to name a few. 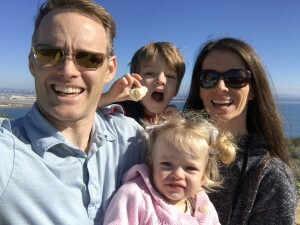 He collaborates with other kid-focused chiropractors throughout the US and Canada, and is constantly researching how to make his care even more effective for kids and adults. Outside of the office, Dr. Erickson enjoys being physically active and does CrossFit and triathlons, running, and road & mountain biking. His greatest passion is spending time with his family and having fun adventures and memorable experiences with them whether camping, going on vacation or being in the great outdoors. Take advantage of our internet special offer of a consultation and examination for just $25! Contact us today to schedule your appointment.